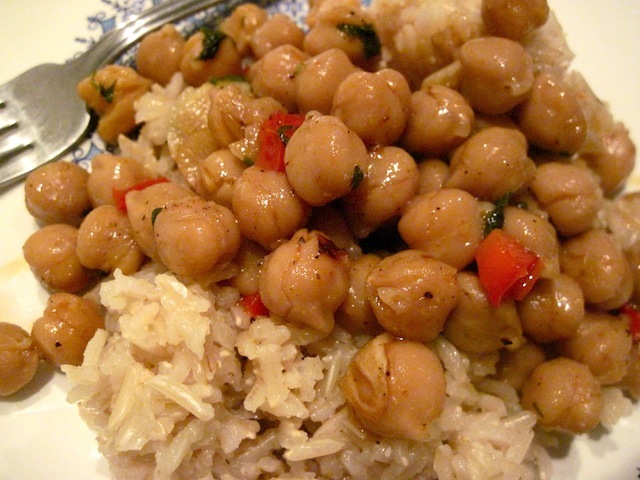 Christening: Chickpea Curry & Failproof Rice – Eat Me. Drink Me. Last night, I was talking with my roommate about the bedbugs. It’s still almost shameful to say, even though they are an epidemic in New York – apparently the whole country. The people I tell, I laugh and say, Oh, it’s fine, I’m just spending a fortune in laundry. But the bedbugs have brought out the worst in us. They have robbed us of our time and stolen our sanity. We bicker over little things and act selfishly because we can’t think otherwise. But mostly, we haven’t made our new apartment home. And somehow, it’s worse to expresses these fears than to suffer them in silence. But now you know. We were in the kitchen, and I don’t remember why, but I wanted to know the secrets of making rice. My attempts always leave a thin burned layer of grains stuck to the bottom of the pot. I think of them as sacrificial grains. Eulas started telling me his method for cooking rice – water to just cover the rice, cooked to boiling, heat turned low and covered while the steam works. Then Sarah – I’ve perfected my rice recipe. You need lots of time, at least 45 minutes. We debated rice cooking methods, discussed the merit of steam, water to rice ratios, pot types, rice types, and lids for half an hour. As the last few words were said, we began to separate; silence pushing us back to our rooms. We could make rice now, Sarah said. I’ll make beans, Eulas said, and with relief we drew together again in the kitchen. We cooked and talked – about something, I don’t even remember – as the music of cars and neighborhood children clashed outside our window. The redolent smell of cumin and pepper and the kitchen’s warm lights. We ate rice and chickpeas at the table that still only has two chairs – I brought out the desk chair from my room. Then we thanked each other and went to bed, since it was already eleven o’clock. Reclaim the space, I keep saying. Make it home, and they will go away. (Also, spray a lot of poison and they will go away.) I didn’t sleep much last night, waking up with phantom itches and fears, but my kitchen is christened. And the bedbugs, they too shall pass. 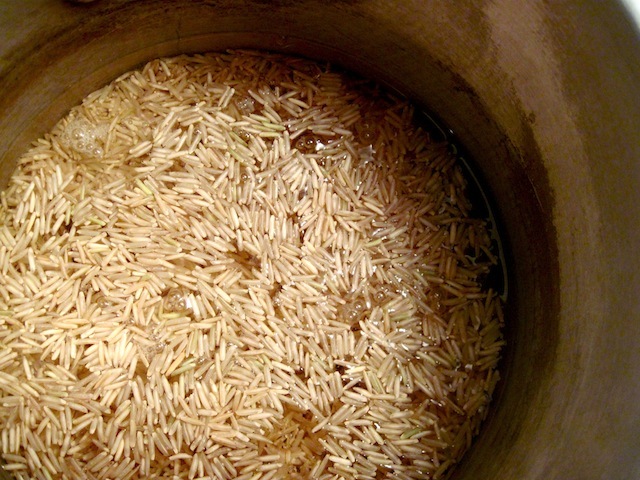 Place rice and water in a small pot and bring to a boil. 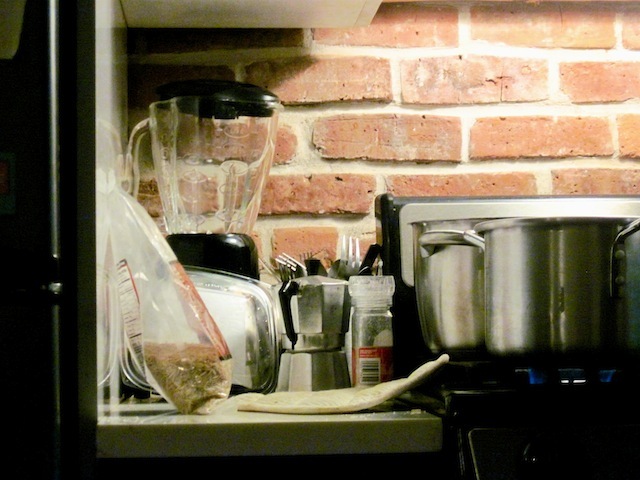 When water boils, turn heat as low as it will go and cover with a lid. Cook 45 minutes or until grains are tender. Simmer everything together in a covered skillet over medium heat until tender and water is evaporated. You may use a plate to cover your skillet if you don’t have a lid.